Neychoru is a North Kerala specialty. To be precise it’s a North Kerala Muslim specialty. I tasted it for the first time at my friend's place and instantly fell in love. It is a rich preparation with clarified butter, cashew nuts, raisins and golden fried onions. The aroma wafting through the house while this is being prepared is enough of an appetizer. All of these qualities make it an ideal treat for our cold, cold weather. Disclaimer: This is not for the weak hearted. Literally. It is so calorie rich that if I call it "healthy" neichoru, it will be one of the best oxymoron you've ever heard. 1.Wash the rice and soak it in water for at least 30 minutes.Drain and keep aside. 2.Heat 1 Tbsp of ghee in a pan and fry the cashews and raisins till they turn golden brown in color. 3.Heat the pan in which you are planing to cook the rice .Pour 3-4 Tbsp ghee into it (you could reduce the amount , but the more the merrier ! ).Add the spices and saute for a minute and throw in the drained rice into it. Saute this for 3-4 minutes.Add salt and mix well. 4.Meanwhile you could heat/ boil the water. 5.Add the hot water into this and allow to boil on high heat. When the water starts bubbling well reduce the heat and continue cooking for another 8 minutes or till the rice is done. 6.Heat the oil for frying and fry the onion. 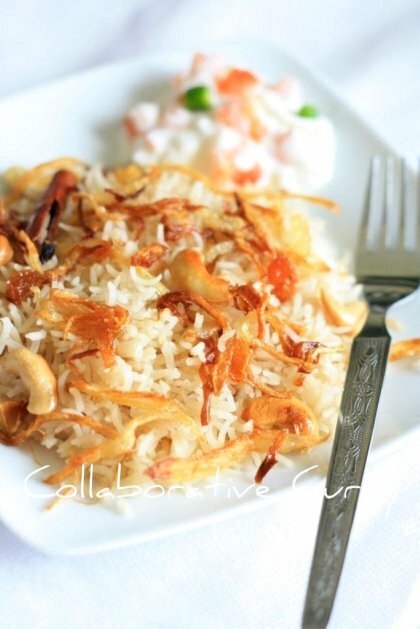 7.Serve the rice after garnishing with fried onion,cashews and raisins. 8.Best served with raita or chicken/mutton curry. Mix everything well and serve chilled. 1.It's important to use best quality basmati rice and best quality ghee for this preparation. As you know the aroma of rice makes a huge difference to your neichoru, or biryani. YUM! Ghee and Kurma with Raita, perfect meal. Nice, love to eat it with mutton curry! Ohhw wow..ohhw wow...Neichoru our Favorite...Nalla tempting anu ketto pic....yummmo!!!!!!!!!!! wow the rice looks soo delicious with all those fried onions and a perfect click..
Ghee is somehting i am not a huge fan, looks so yumm . Eating healthy foods once in a while should not hurt anybody right? Looks delicious. Oh wow this is neuchooru week I guess... looks so tempting..eventhough I cooked 4 days back.. Nice click . lloks fav.. the aroma of ghee in rice is indeed inviting.. Very less ingredients with more taste.Easy and yummy recipe. Ghee rice and raita are my son's fav. Looks delicious. Yummy and mouthwatering dish!!! Love the way its presented!!! Wow, looks so inviting, love ghee rice..love the way you presented..
this is the most comforting meal anyone can make i think..your looks so amazing..
Kuda cheriya bowlil chicken annoo? Rice looks absolutely delicious and amazing click. Woow...they look gorgeous!!! sounds so good! Simple and aromatic rice, as always gorgeous picture!!!! Ghee rice looks really yummy. The beauty of ghee rice is that its mellow and goes well with any side dish, be it veggie or non-veggie. So anytime I have a party, this will always be there. Great shot BTW. Lovely - what could be better with ghee rice and korma? Wow, my all-time fav NeiSoru! I liked the side dish there too...chicken? Raita is always a must have dish in my house! The quality of your pics are just amazing!!! 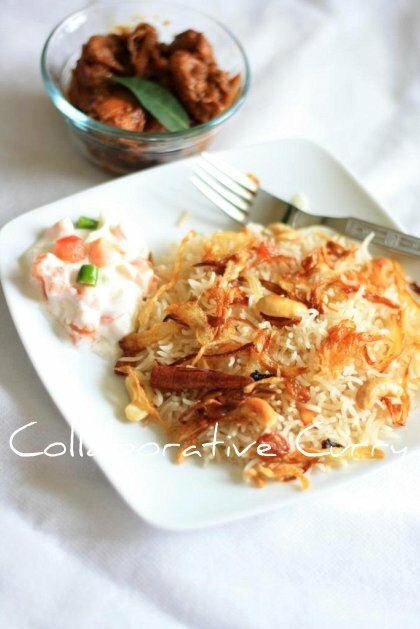 Rice looks apt to be served for lunch...makes me drool here, lovely clicks! Such a yummy rice salad! I love the raisins and cashews here! Wow This looks royal and tasty ! Infact this is easier version of biryani or pulav yet yummy ! Definitely one of our dinner next week! Delightful combo! Love ghee rice with fried onions..yumm! Looks Yum specially ghee rice. nice presentation! !easy and simple ghee rice. Ghee rice with chicken curry a yummy combo....Looks delicious with the fried onions. This is delight full and Joanne being ur sweetfren too, am inviting u here for her little party(its her birthday dear -i know that u know dear) which is a suprise party for her ...do leave her a wish in the sprinkles ok.....my feeds arent working or updating ,so am trying my best to find all her pals to leave her a wish in the sprinkles before she gets there or even after....will ya help too to make it a little sucess....and leave her a wish too? Mmm I would love to have the smell of this wafting through my kitchen. Looks fantastic. Yummy ghee rice...adipoli presentation namitha. I very much agree with vrinda, this tastes too good with biryani rice. Yea what vrinda said is right.njan kannur aayondu ariyam.biriyani rice kittum. pakshe naatil basmatikku vilakooduthal ullondayiriknm,biriyani rice use cheyyunathu ennanu njan karuthiyathu..
mom makes this back home for every spl occasion... love this... Nice clicks as always!